Welcome to the 2017 Buccaneer’s Reef 3D sailing ship modeling Contest! Hello Ladies and Gentlemen, Mates and Matettes. I am happy to announce that our little website is sponsoring a modeling contest and would like to tell you why. Secondly, I have seen many great models built and shown off on other sites for years, but no offers of bringing them into our favorite game so that they could be shared with tens of thousands of people/players. Third, is that now as we are beginning to commercialize – (even though we will always still offer tons of free content as well) – I am hoping we can attract some talent here that might be interested in what we are doing and willing to help out and potentially become part of our team – especially now in our infancy. Sounds like an opportunity to me eh? Models submitted CANNOT be bought from an online 3D modeling sales outlet such as Turbo-Squid or the Unity Store, UNLESS the models were built by the person who provided them to these outlets to begin with. Models submitted MUST be the actual work of the modelers who provide their completed entry. Any contestant proven to have illegally taken and submitted the work of another modeler (who is not authorized to make said submission) will be disqualified. In addition, if proof of this is made publicly available, contestant will lose their membership to Buccaneer’s Reef as well. Models submitted can be from other video games provided the contestant is the original modeler of said ship model and has permission to take it from that resource. e.g. Portalus/Flying Labs agreement that models submitted by modders for POTBS (Pirates of the Burning Seas) can freely be given to any other video gaming effort or individual that the modeler desires to give them to. In addition, models do not have to be new or recently built. They can be old work from decades ago provided they meet all other requirements. Contestant Modeler must be a member of Buccaneer’s Reef or obtain a membership in order to enter the contest. 5a. Partially completed work or incomplete work can be entered but will only be allowed to compete for the best of category/class prize money and NOT for the primary 1st, 2nd or 3rd prize rewards. 5b. If modelers are unable to complete said models because of unfamiliarity with our tools, formats or porting procedures in order to get them into the game, please contact our resident expert Orazio so that help and advice can be obtained in order to complete the models prior to the deadlines for entry into the contest. By entering the contest, modelers agree and permit that their models are authorized and licensed to be used in GOF ERAS2. In addition, Buccaneer’s Reef is authorized to use images of entered models to support the ERAS2(TM) game and the Buccaneer’s Reef(TM) website, projects, and/or future features and articles. 6a. Modelers can stipulate that they wish their models to be part of the open source/public domain freeware part of any future downloads supporting Buccaneer’s Reef games, or that they authorize their models to be used for inclusion in the commercially owned segment of our game(s). 6c. That the modeler wishes to become part of our Buccaneer’s Reef game development team and receive a segment of our profits. *NOTE – This will only be honored if their contributions warrant such consideration as assessed and agreed upon by the whole of the Buccaneer’s Reef team. In other words – they will have to build more than just one model and continue in the process – providing input to our overall effort in order to receive shared rewards. Existing team members will take a vote once noticeable contributions have been provided on whether or not to admit the prospective modeler into the gaming development team. Regardless of whether or not the candidate is accepted into the team or not, by electing to participate as a prospective candidate, their model(s) become the licensed property of Buccaneer’s Reef. 6d. If said modeler has elected to provide said model to be used as the licensed property of Buccaneer’s Reef IAW Para 6,6a., the modeler still retains the right to freely give said model to other 3rd party individuals or other gaming efforts. However, if said modeler has elected to follow ITEM 6b and or 6c., they cannot sell their model to any other third party or gaming effort – as the model becomes exclusively licensed to Buccaneer’s Reef alone. Modelers are encouraged to make models that will directly support the start date of any COAS starting game-play through which is the year 1665. 7a. A caveat to this however is that – Models can be from a few decades before the era of the game, because we know historically that many ships lived long lives and were well maintained. In addition, many ships of obsolete design were still built long after these designs were no longer popular. 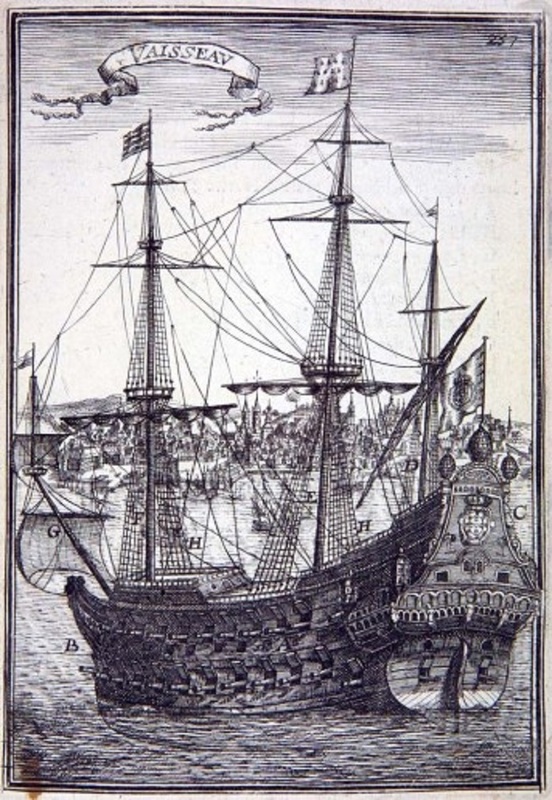 A good example being the Spanish/Basque caravels – which were still being built in the first decade of the 17th century – even though their designs were from over a hundred years before. So ships from before our game era shall be allowed in entry, however ships from after our era will not be considered or allowed to enter the contest. One exception to this – is if it can be shown that the plan for a ship from 1730 or 1740, etc. is identical or nearly identical to one from before 1725. Models must be to scale, must be built in our format, must be ported into our game in order to observe and play with them, and be able to fully work in our game – e.g. sails work, crew walks, guns fire, ship sails, etc… If you have questions about our format and/or how to convert your model, please contact/PM our resident expert Orazio. Models must be received complete by December 15th, 2017 for judging. This contest will be decided by both voting members of Buccaneer’s Reef and a panel of judges. Judges will consist of the Buccaneer’s Reef Gaming Development Team and each team members vote is counted as 2 regular member votes. In addition, extra points can be awarded or detracted by the judges for excellent noteworthy features or defects – each of these points (added or deducted by a judge) will be worth 5 votes. 9a. Fantasy models are not allowed, e.g. Flying Dutchman, Black Pearl, Jackdaw, Captain Hook’s ship, etc… any fantasy model submitted will be returned to sender. 9b. Models can be built from existing plans or “free form” by eye from existing historic paintings/ models. Models can be a historic interpretation of a specific ship or type of ship. Models can be a specific named example – OR – they can be an example from a known type of existing 17th century ship class. If the later, modelers are encouraged to name their model and give an explanation of why the name was chosen. Judging: Models will be judged for completeness, historical correctness, originality, aesthetics/artistic interpretation, purity of form and construction, texturing, and overall presentation to include defects. 10a. Each voting member can cast one vote for the best model and another vote for a model in each particular class. Judges votes are counted as 2 regular member votes. In addition extra points will be awarded or detracted by the judges – each of these points (added or deducted) will be worth 5 votes. 10c. Points will be added for special artistic and historical features added such as correct figureheads, specific historically correct or nationality correct decorations or color scheme, etc. 10d. Thirty points will automatically be added to any ship which is built in the correct time period. 10e. Fifteen additional points will be added if the ship is an example of a known shortcoming or one required for the game as listed in our “Ships Needed List”. See SHIP MODELS NEEDED for list. 10g. Contestants are allowed to vote for their own models one time. Understand that if they cast this vote for themselves, they cannot cast an additional vote for someone else. 10h. In the event of a draw or split decision, the Presiding Judge, Modernknight1 shall have the ability to cast an additional vote of decision to determine a winner. Prizes: 1st Prize shall be $1,200 US dollars, 2nd Prize shall be $600 US dollars, 3rd Prize shall be $300 US dollars. 11b. Contestants are allowed to enter as many models as they wish. With this in mind it is possible for a single contestant to win every prize if the voting population and judges are agreed. 11c. It is also possible for one contestant to win multiple prizes for a single model depending on how the voting goes. A contestant is not eligible to receive more than 4 specific prizes for a single model. If voting gives them more – then they shall receive the four largest rewards and another vote will be taken for the other categories without the said winner’s entry being considered. RECEIPT OF PRIZES: Contestants are responsible for giving the contest President (Modernknight1) a way to pay them their prize(s). Prizes can be sent via certified mail in the form of a cashiers check or money order to a provided address – domestic or international. Prizes can be paid via a provided Pay Pal account as well. If the winner is from the US, contestants also have the option of receiving prize money via a wire through Western Union. Prize money can also be donated to Buccaneer’s Reef in which case the prize will be divided between the core team members. 12a. DEADLINE: Once again, ALL models must be submitted by December 15th for judging. Voting and judging will occur over the next 10 days after. 12b. Contest winners will be announced on December 25th 2017 – on Christmas Day on Buccaneer’s Reef. A separate announcement will also go out on Buccaneer’s Reef Facebook page and may be featured on Youtube and other social media. 12c. Prize money will be paid on January 1st and/or 2nd of 2018. Disclaimer: All prize money is being provided from the contest President’s private funds – and not from Buccaneer’s Reef(TM).